Electronic Superhighway is the name of a historical video installation by Nam June Paik. But it is also the title of a contemporary exhibition organised by Omar Kholeif at Whitechapel in London. An inventory of rare relevance that goes back in time to the evocation of Experiments in Art and Technology whose mission, from 1966, was to get artists and engineers to work together. Among the most recent works in the Electronic Superhighway exhibition, is a piece by Olia Lialina dating from last year, which is also available online. 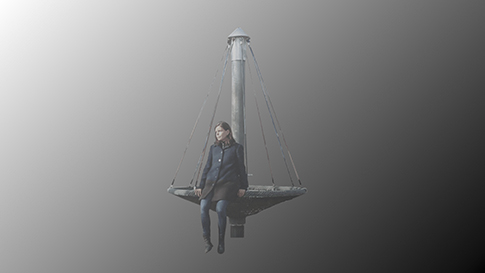 We find her sitting on the edge of a turnstile spinner, like those found in children’s playgrounds, making just the slightest effort to activate it. But the main actor in this otherwise quite ordinary situation is the thick fog that sometimes conceals the artist when it is not entirely filling the screen space. It is the title of the work, in this case the web address ‘best.effort.network’ which gives us the key to reading it. The extension network, it should be first noted, is particularly popular with companies proposing online services that soon we will not be able to refuse. While the combination of the terms best and effort perfectly symbolise the relative quality of low-cost services that threaten net neutrality. For there are not, to this day and beyond national coverage, privileged users on the Internet. But for how long if governments were to give in to the corporations? Jeremy Bailey, a self-proclaimed ‘famous new media artist’ at the opening of his video collection on YouTube, shows a dozen drawings similar to those that inventors file to accompany their patents. 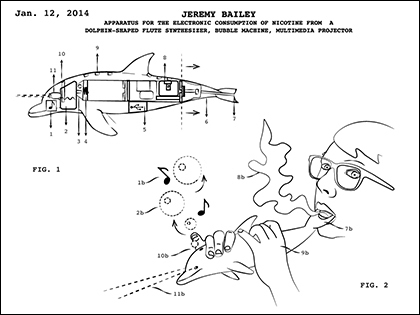 Titles, like Apparatus for the electronic consumption of nicotine from a dolphin shaped flute synthesiser, are all the more descriptive. Add to this a miniature video projector outfitted to his imagination! The artist is at the centre of most of his concepts, as he has, over time, become the main subject of online clips documenting his performances in a line of early video art that faced the camera from within a studio. But the practice has changed. 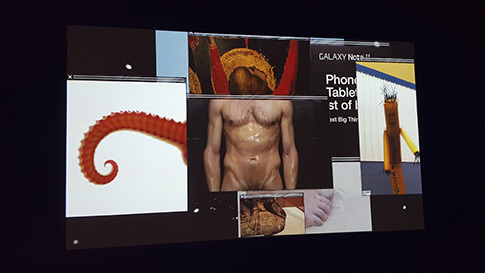 Whereas the video artists of the late sixties indirectly targeted an informed public in art centres and galleries, the Canadian performer appeals directly to Internet users. It is indeed there where notoriety is acquired. So, it is also through the door of a public Internet that Jeremy Bailey went to Whitechapel. Camille Henrot tells us about the origin of the world in her film Grosse Fatigue which earned her a Silver Lion in Venice in 2013. A video creation, which since the Biennale, has been seen in a considerable number of centres and museums of contemporary art around the world. Which means that its ideas are global to the point of making us all wonder about our distant origins through science as well as myths. The most diverse content follows one upon another at high speed. The interfaces of application windows, which throughout the film create a link between images of different natures, seem here more present than elsewhere. In this exhibition ‘Electronic Superhighway’ the subtitle ‘From Experiments in Art and Technology to Art After the Internet’, there is indeed the question of post Internet. An Internet that has radically changed our access to knowledge, which is today more democratised and instantaneous than ever and this, in a resolutely media approach. The Electronic Superhighway exhibition offers us a historical overview of digital practices falling within the fields of art. The works that comprise it, like the series Versions by Oliver Laric, offer us just as many readings of the societies that produced them. So, lets go back to 2008, when the Iranian online media Sepah News, guardians of the revolution, published a picture of the simultaneous launch of four missiles illustrating a formidable striking power. 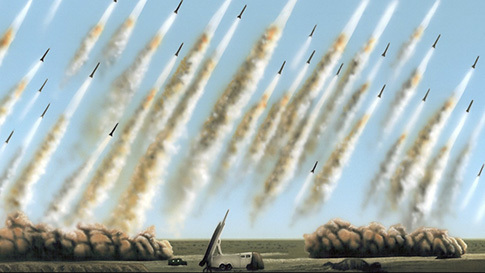 But it turns out, after observation with the naked eye of the missiles and the fumes that escape, that one of them is actually the result of duplications. The picture having disappeared from the server where it had emerged, it multiplied in a competition that was as global as it was improvised. Of the ten visuals shown us by the Austrian artist living in Berlin at Whitechapel in London, he has apparently not re-touched any, because it is the viewer who is engaged in this proliferation of versions. And it doesn’t really matter knowing which image is the original when it is the motifs for the manipulation among other changes that might attract our attention. On the first floor of the Whitechapel, a number of works that have marked the history of net art have been brought together by rhizome.org. So it is not a surprise to discover the site that artists Joan Heemskerk and Dirk Paesmans created at wwwwwwwww.jodi.org in 1995. It was at the beginning of the ephemeral Net.art movement, which associated them with Heath Bunting, Vuk Cosic and Alexei Shulgin for three short years. But the site continues to intrigue us. Starting with its address, whose mystery we can appreciate all the more if we project ourselves back in time twenty years. 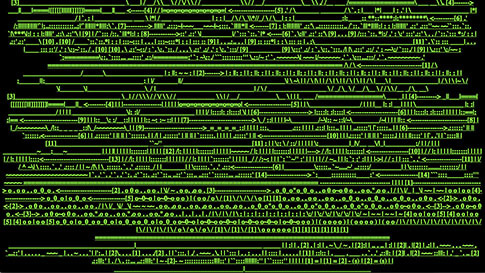 As for the particularly illegible character of its home page, it evokes the most extreme practices of ASCII Art. For it is in the source code that the message finally appears to us in the form of characters outlining a thermonuclear bomb. Again, to understand the idea, it is useful to enter into the spirit of the interwar period when the Gulf States were already torn between those who had the bomb and those who wanted it. Something like the dispute between those who think of the Internet as the space of all freedoms and those who already want to restrict it! 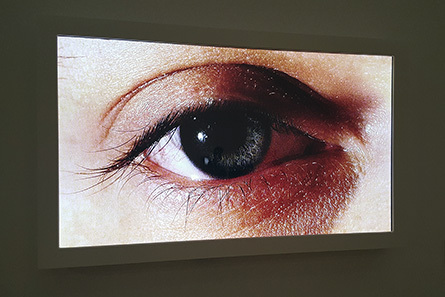 We continue on the floors above, going back in time until we sense the feeling of a presence and realise that the eye of Surface Tension – an interactive video installation by Rafael Lozano-Hemmer 1992 – is watching us. In its oversized excess, it is literally locked on to the essential of our actions. It is impossible then to part without having in mind the slogans that George Orwell devised in 1949 for his book 1984: "War is peace. Freedom is slavery. Ignorance is strength." The author described then a world of surveillance, whose reality in this area the artist now knows, has far surpassed fiction. What is significant, beyond the obvious plasticity of this work, is the immediacy with which it engages us. So we feel the elasticity of the link, which in the invisible, connects us to it. Until the very moment we feel trapped, because ignorant of the possible intentions of this Cyclops, we know only the dexterity of its regard. Lastly, we end our journey in time via the uses and practices of technology in art with a work by Eduardo Kac, which takes us back to 1985. 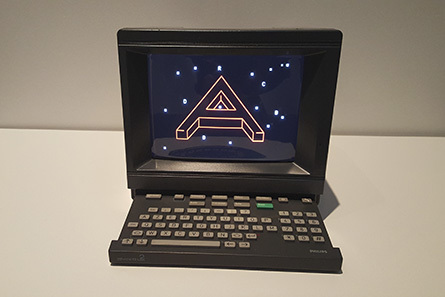 Presenting itself as a Minitel (very early online videotex French telephone computer), it is called Reabracadabra as Abracadabra is a holographic poem by the artist that predates it by a year. Those who know the work of Eduardo Kac, also know his commitment to poetry as a language, even in its transgenic creations revolving around the encryption of messages combining science with philosophy and even the divine. An artist of his time, Eduardo Kac has continued to capture the rhythm of technological innovations as they emerge, going from the use of telecommunications to that of nanotechnology to create his works. His various Minitel works from the mid-eighties are now case study examples because they disappeared to re-emerge through a long process ending in 2015 during a residency at the media archaeology research laboratory of the Ecole Supérieure d'Art d'Avignon. Because it is urgent, after so many conferences and symposia, to finally take action for preserving variable media works, so that the creations of today will not be gone tomorrow. Written by Dominique Moulon, March 2016.